Julabo’s recirculating chiller FL series are the latest generation of chillers for routine cooling applications, and all 20 models are now available from John Morris Scientific . These recirculating chillers come in both air or water cooled options, providing the ideal solution for any application. 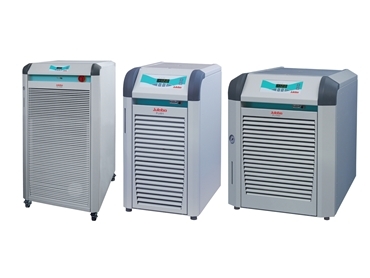 The compact recirculating coolers with chilling capacities of up to 1.7 kW are ideal for typical laboratory applications and can be placed under the laboratory bench. Models with cooling capacities up to 11 kW are suitable for the cooling of electron microscopes and lasers. Working temperature ranges for these coolers cover –20°C to +40°C, while the maximum return line temperature of +80°C sets new standards and offers application protection. Unlike most chillers on the market the FL series recirculating chillers can be operated with water, water-glycol mixture and silicone oils. All units have an LED temperature display integrated into a splash proof keypad for easy cleaning. The lift-up cover is placed on the top, providing easy access to the filling port. All models include an easily visible filling level indicator.